It’s been two weeks since I posted here, and several things have happened. Christmas! (requisite trip to Seattle included), my birthday, the New Year… And I finally caught up on Downton Abbey, saw Pitch Perfect (I recommend both! ), and I’m still blogging, though you wouldn’t know it from my silence. Hope all of you had a happy holiday season. I should be around more now that December is past. As I’ve said before, I’m devoted to Mercedes Lackey’s Elemental Masters series. I pre-order each book, read immediately upon arrival, and if it’s up to snuff, add it to the honored ‘re-read’ shelf. There’s something about Edwardian England mixed with magic and fairy tales that is very me, and I can’t imagine not liking one these books. Steadfast, the ninth title in the Elemental Masters series, will be released on June 4, 2013 by DAW Hardcover (Penguin). 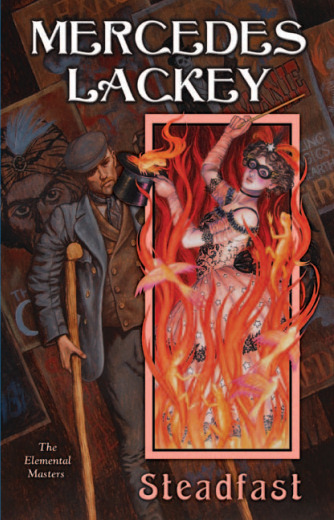 The new novel in Mercedes Lackey’s bestselling series of an alternative Edwardian Britain, where magic is real—and Elemental Masters are in control. Glad you are back. Happy belated Birthday and don't you just love Downtown Abbey? Welcome back! Great pick, never read her before so will check her out. Happy belated birthday and great pick! It looks amazing!!! I haven't heard about this series yet, but it sounds cool. An alternative Edwardian Britain? I'm in! Happy Birthday, Merry Christmas, and Happy New Year! :D I took a bit of a break for the holidays, too, and it was nice to just kick back and enjoy them! I've never heard of this series and I've never read any Mercedes Lackey, but it looks like great high fantasy! Happy belated birthday! I think everyone takes a break or slows down at the end of December. I generally prefer Mercedes Lackey when she's writing with other people, but I might check this series out. I've heard really good things about this author. I really should give her a shot. I love Lackey and her Valdemar books. I never read the Elemental series before, but I think I have one or two of the books here somewhere...can they be read out of order? I haven't read a book in this series in a very long time. I may have to start them all over again. Wahooo! You've been busy. I loved keeping up on Twitter. Great pick. And did I ever say Happy Birthday?! !